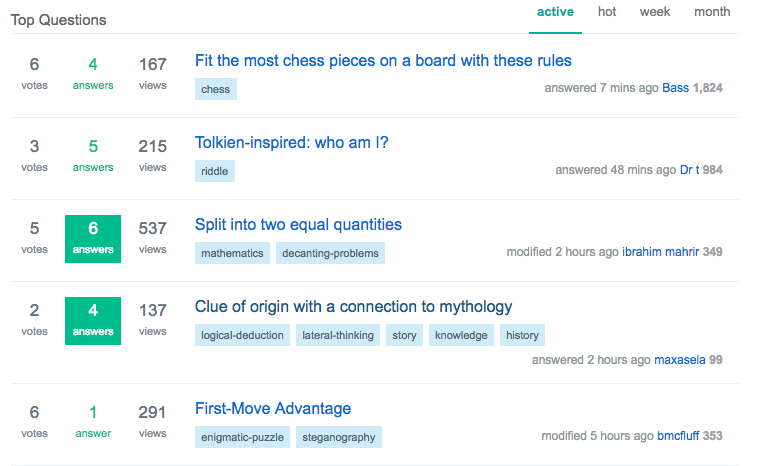 The "home page" of a Stack Exchange site will filter out all questions that fall below a certain threshold. This is -4 score for main Q&A sites, and -8 for Meta sites. This is because the home page is meant to highlight quality content, so that a brand new visitor will see good stuff. This happens on all tabs on the front page, including active. However, I don't think it should be this way for a few reasons. For science, I edited the MSE question that isn't showing up in one of the screenshots below (sorry, I know it's super off-topic), and it still doesn't show up in the active list. This means that some vandalism is likely to fly under the radar. Heavily downvoted questions that are edited don't get any attention, even if the question is perfect now. New answers don't get any attention. If people don't vote, good content can't "float to the top" like it should. I understand the desire to not show "garbage" to new users visiting the front page. But I don't think it makes sense to not show these posts to users with some rep (or even an account) on the site. That's right; the main page is meant to highlight decent content. The vast majority of visitors to a site aren't regulars; they're the people coming from Google, the people following a link from a tweet, and so on. They don't know much about SE. If they see a bunch of junk on the main page, they'll conclude that we're low-quality instead of realizing that there's a whole curation process that we follow (close/reopen, edit, requests for clarification, etc). The "questions" link is there so that you can see all questions that have come in recently, including the bad ones. It's true that it won't show you new answers to old questions, but if you're answering a question that's already been downvoted off the front page, you know you're going to have trouble getting views. You ask: what if one of these questions gets edited and fixed -- nobody will see that and remove downvotes. You'll need to draw people's attention to the question in that case. You can do this on your site's meta or in chat. I've seen both approaches on the sites I'm active on. Tell people why you think it's worth another look, what's happened since it was downvoted off the front page, and in my experience, people will take a look. If they agree with you they can vote; if they disagree, they can tell you what's still wrong. Either way, you're getting people to take another look and help rescue the question. It's best to only do this for questions that deserve rescuing. If all you did was fix some typos and the real problem is that the question is way too broad or unclear or whatever, there's nothing to see yet. Focus your efforts on posts that are likely to benefit the site. There are two problems here: the UI design and (if I'm truly being honest) me (i.e. the OP). I knew that there were two active tabs, but I never understood the difference before. That's how part of the problem was with me. Obviously, this means that the feature I originally requested doesn't make sense. However, I think that changes are still necessary because the UI is confusing. I counted, and there are 13 different lists of questions on your average site (e.g. ELU), 15 on Mathematics SE, and 17 here on MSE. 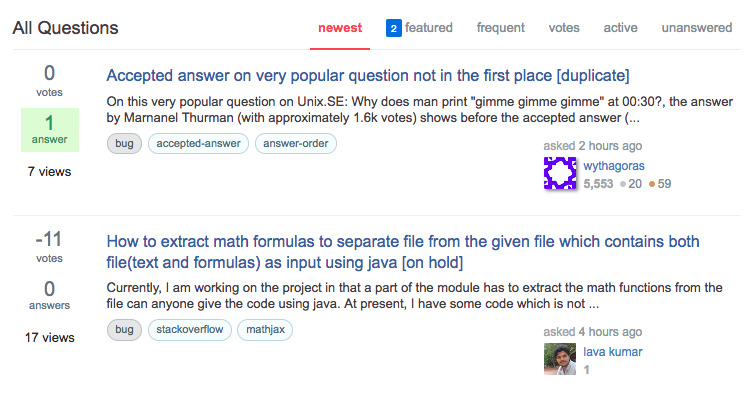 Two of these lists show active questions (where one filters out downvoted questions), and two of them are identical as far as I can tell (questions > unanswered and unanswered > votes). None of these tabs filtered out heavily downvoted questions (which likely made it all the more confusing on sites without this navigation). I think heavily downvoted questions are those that were posted in a very poor state. They can be redeemed by improving them, but I think the advantage on visibility should go to well-thought out questions that are well-received at the outset. I think it is fine to answer poor questions, but what we are seeking is great Q&As, so any time I choose to answer a poor question, I accept the risk that it may not get visibility, and may even be deleted along with the poor question. My advice is to try to always post great questions at the outset, and not rely on them being improved later either by other users or yourself. There is a way back for such questions but that road is far rougher than the smooth road that great questions receive. Not the answer you're looking for? 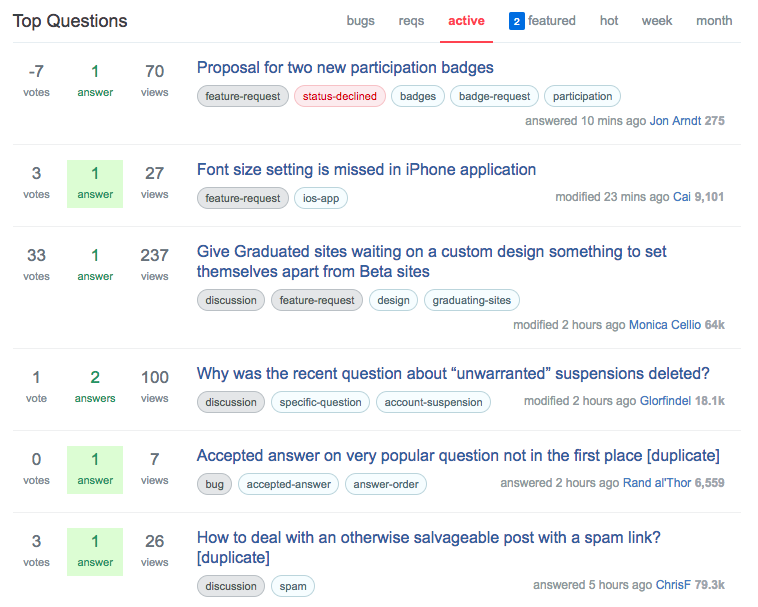 Browse other questions tagged feature-request active . Could featured question list contain all items when less than 5-8?